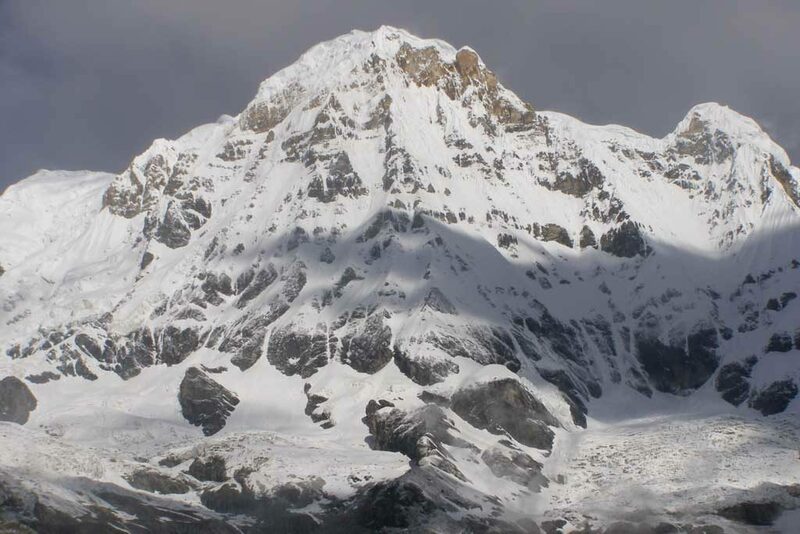 Annapurna Base Camp trek is one of the most popular trekking trails among the solo and adventure trekkers. This trip can fulfill their dream to see the 8,000 meters mountains and glaciers in less than 10 days city escape. 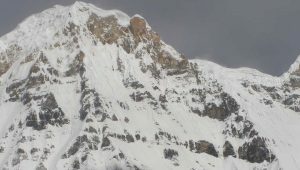 It is also known as the Annapurna Sanctuary trek. The trek offers an extraordinary variety of ecosystems due to its unique combination of heights, depths and cultures. This oval-shaped high glacial basin lies at an altitude of over 4,000 meters and surrounded by a ring of mountains-the Annapurna Himalayan range. 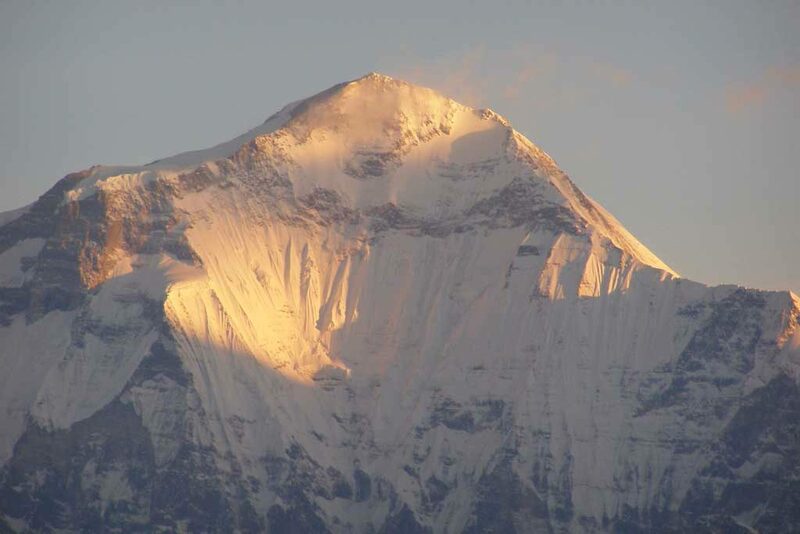 The Annapurna (8,091m/26,546ft) and Dhaulagiri (8,167m/26,796ft) massif are the center of attractions of this trek. Annapurna Sanctuary is like a natural amphitheater and has been sacred to the local people for centuries. The entire sanctuary is a holy land to the Gurung tribe of Annapurna region. 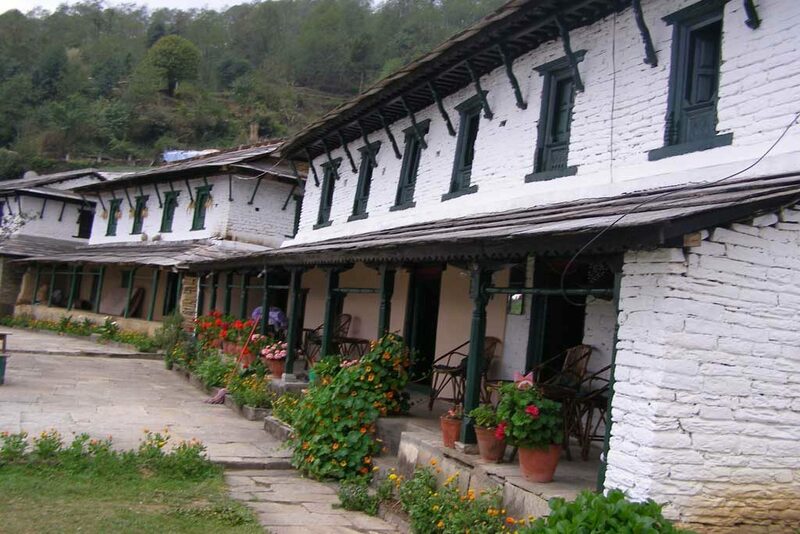 The Annapurna Base Camp trekking starts at Nayapul, about an hour scenic drive from Pokhara. We continue our trek towards the west trail from Birethanti which follows to Tikhedhunga and Ghorepani. The next early morning, our guide will wake you up to hike to Poonhill. 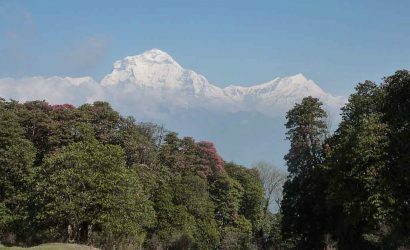 Poonhill is the stunning view point that offers the panoramic views of snow-capped mountains of the Annapurna Himalayan range. The views at sunrise from Poonhill are simply outstanding and impressive. We then trek towards Chhomrong and commence our journey into the Annapurna Sanctuary and further to Annapurna Base Camp. 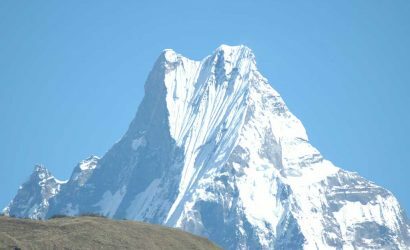 Therefore, Annapurna Base Camp trek is a good introduction to higher altitude without being too strenuous so that we have categorized this trek as medium-hard trek. 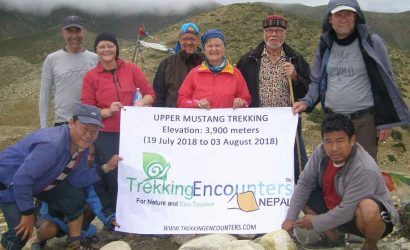 Another positive side of the trip is it won’t require any internal flights like in the Everest region. 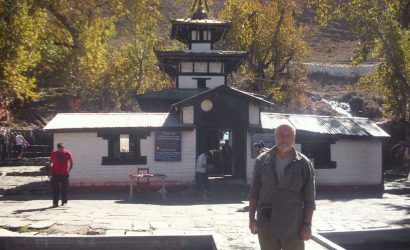 Thinking for more challenging adventure holiday in Annapurna? 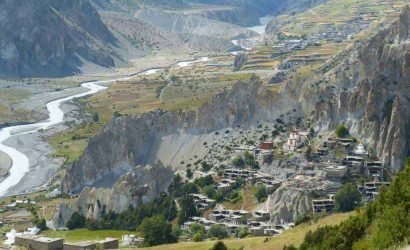 Annapurna Circuit trek is the best alternative for those who are looking at more challenging adventures for longer duration. We take a drive for one hour from Pokhara to Nayapul. From the road at Nayapul (New Bridge) we go down the slope, cross a tributary by a suspension bridge and follow a broad track to the village of Birethanti (1,040m/3,412ft). 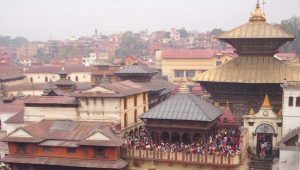 This is a busy, attractive important bazaar with a number of shops, a post office, hotels and teahouses. The ACAP check post is located at the end of the suspension bridge where you must show your entry permit. Leaving Birethanti we keep to the north bank of the Bhurungdi Khola. Passing through bamboo forest you go through three other villages, Matathanti, Sudame and Hille before reaching Tikhedhunga where some of the lodges are run by ex-Gurkha soldiers, the village is near the confluence of the Tirkhedhunga and Bhurungdi Khola (River). Trekking time 4-5 hours. Out of Tikhedhunga or Tirkhedunga we start to tackle the long staircase of stone steps over 3,000 of them that lead to Ulleri (1,960m/6,430ft). This will take us around 2 hours. We continue to trek to Banthanti (2,210m/7,251ft) and then to Nayathanti or Nanggethanti (2,430m/7,972ft) where keen bird watchers should keep a look out for the grey Langur as it inhabit the rhododendron forests at either side of Ghorepani. We stay overnight at Ghorepani/Ghodepani. 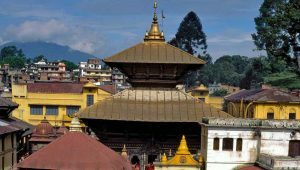 This is a bustling village with shops, lodges and camp grounds and because of the attraction of nearby Poonhill the route is the most heavily traversed in Nepal. Trekking time 5-6 hours. We have an early morning start to catch the sunrise at the summit of Poonhill or Pun hill a unique trekking experience. We start out on a path from the centre of Ghorepani village and climb for about one hour before sunrise and climb through rhododendrons to the top. There is a lookout tower on the highest point and below it is a very welcome teahouse. We will take in the stunning view of the sun rising above the whole Annapurna range and the Dhaulagiri massif, a truly spectacular event. After taking many photo’s we then set off for Tadapani “far water” not to be confused with the village of Tatopani “hot water”. The “far water” title dates back to times before a piped supply came to this remote lodge settlement and water had to be carried here from afar by locals and porters. The seven fairly large lodges provide spectacular views across the Kimrong Khola (River) valley to Annapurna South and Machhapuchhare. Trekking time 6-7 hours. Trek Tadapani to Chhomrong (2,170m/7,119ft). We start our trek from Tadapani and go through the village of Kimrong (1,880m/6,168ft), continuing onto Taulung (2,180m/7,152ft) and then we enter our overnight stop at Chhomrong. Trekking time 5-6 hours. Trek Chomrong to Dobhan (2,600m/8,530ft). Today we start off by navigating down the steep stairway which consists of over 2,000 stone steps to reach the valley bottom an altitude difference of more than 300 meters before a steep climb up the other side of the valley. Trekking time 5-6 hours. Trek Dobhan to Machhapuchhre Base Camp/MBC (3,700m/12,139ft). Our trek winds up through bamboo forest to Hinku where we descend to cross a ravine and climb over the other side. This is a classic avalanche trap and on occasions the gorge is virtually blocked here and is often necessary to climb over the debris. We continue to the village of Deurali (3,230m/10,597ft) and continue up to Machhapuchhare Base Camp for the overnight halt. Trekking time 5-6 hours. Trek MBC to Annapurna Base Camp/ABC (4,130m/13,500ft) & return trek to Bamboo (2,310m/7,579ft). Today we start the steady climb to ABC, never very steep yet the altitude is likely to make you feel tired. Take a slow pace and enjoy the expanding panorama before you. It will take us about 1-2 hours to reach the base camp where we can take a well earned rest and enjoy a cup of hot tea before we explore the surrounding area and view the glacier at the heart of the Sanctuary. We will then commence our descent back to Bamboo. Trekking time 5-6 hours. Trek Bamboo to Jhinu Hot Spring (1,780m/5,840ft). Return trek continues through the same trail until Chomrong. The trail goes through the rhododendron and bamboo fields. The trail then steeply descends to Jhinu Hot Spring. Trekking time 5-6 hours. 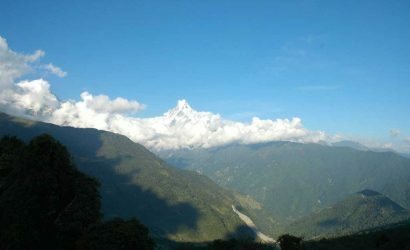 Trek Jhinu to Nayapul (1,070m/3,510ft) and drive to Pokhara. Today we continue our trek along the side of Modi Khola River to Birethanti. We continue the trail to the road that ascends to a taxi stand at Nayapul. We catch a taxi or bus from Nayapul and drive back to Pokhara. Trekking time 4-5 hours. We are more relaxed in Pokhara with the beautiful morning and later we drive back to Kathmandu. Regular tourist buses leave at 7am.